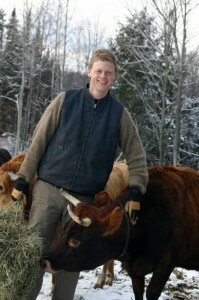 Author Ben Hewitt (He's the one without the horns). The words “local, seasonal, sustainable” have been repeated so often and with so little thought that they have become soothing background noise, feel-good mood-music for any socially conscious eater worth his or her naturally obtained organic sea salt. So it’s refreshing to encounter a book that treats the subject intelligently. Was it Holden Caulfield who said that the measure of a good book was one that makes you want to call up the author on the phone? Reading Ben Hewitt’s The Town That Food Saved impelled me to pay a visit to the author at his home, a raggedy farmstead at the end of a rutted, muddy, unmarked lane tucked among the folds and hollows of north-central Vermont. Tall and lanky, Hewitt is in his late thirties and grew up in rural, working-class Vermont. His formal education ended before he completed high school. On the morning we met, his red knit cap was flecked with bits of hay, and he wore a faded blue shirt and olive-green work pants dabbed with either mud or manure from the dozen-or-so cows and sheep in the shed next to his house. But Hardwick may be changing. A band of youthful, boundlessly articulate entrepreneurs are rebuilding the area’s economy on a foundation that may be more substantial than the bedrock on which its first boom was based: sustainable, local food production. Hewitt is an amiable skeptic and a storyteller of rare skill who seems incapable of crafting a dull sentence. He calls his tale’s key players agrepreneurs. Tom Stearns of High Mowing Organic Seeds is the movement’s hyperkinetic mouthpiece. Pete Johnson of Pete’s Greens combines unbridled ambition with an entrepreneurial green thumb. Andy and Mateo Kehler of Jasper Hill Farm quietly produce $15-a-pound artisanal cheese that may provide a value-added financial model for dairy farmers struggling under depressed milk prices. A few dozen other well-drawn characters populate this bucolic foodscape. Many came from “away” with their degrees from prestigious liberal arts colleges. Most are fond of articulating the philosophical underpinnings of their agrarian ventures. None see any contradiction between doing good work and making money—preferably lots of it. Undeniably their efforts have brought 125 jobs to an area where every job counts. In doing so, they have created a vibrant, mutually supportive community centered around food. But Hewitt is also well aware of the ironies and shortcomings of the locavore trend and its upscale cachet. In a town of 3,200 which still has a median income 25 percent below the state’s average and an unemployment rate 40 percent above it, real locals are more likely to buy processed cheese food from the Grand Union supermarket than pick up a piece of artisanal blue cheese from the farmers’ market, more likely to dine on $3.38 chicken fried rice at the Yummy Wok than venture across main Street into Claire’s, a “community supported restaurant” that features local fare and offers $9 vegetable tagines and $24 grass-fed steaks that can be washed down with a selection of decidedly non-local wines. Still, Hewitt comes away feeling that Hardwick’s recent history may be providing a template for a food system that could save all of us. “The fact is that our nation’s food supply has never been more vulnerable. 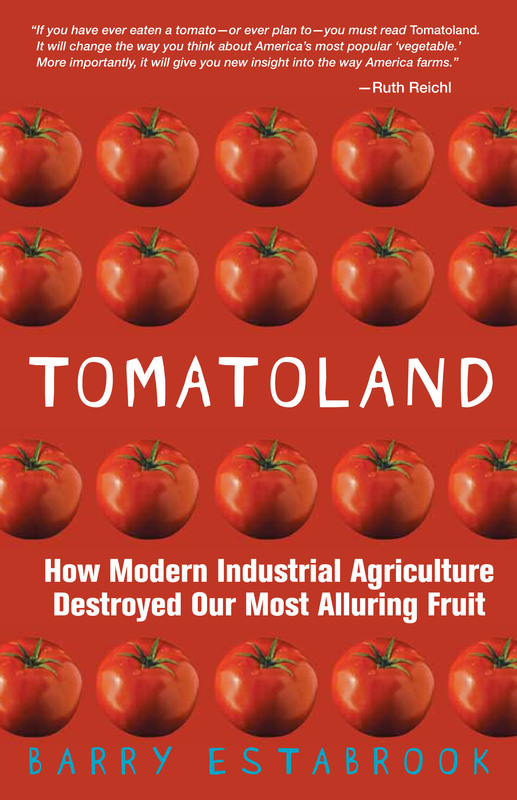 And we, as consumers of food, share that vulnerability, having slowly, inexorably relinquished control over the very thing that’s critical to our survival,” Hewitt writes. What is at risk, he contends, is the entire model of the way we nourish ourselves. Fixing this broken model is a matter of national urgency. Should our industrial food system collapse, the Hewitt family (which includes his wife and two young boys) will have far less to worry about than most of us. 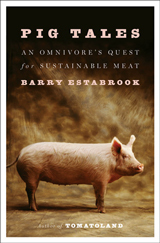 They raise 80 percent of the food they eat: in addition to all their vegetables, they produce milk, beef, lamb, pork, chicken, eggs, blueberries, raspberries, apples, and maple syrup. Their house, which they built with help from friends, gets its electricity from solar panels and its heat from woodstoves. I was really moved by this example of what the people of Hardwick, VT have done to build a localized food system and how it supports the local economy. 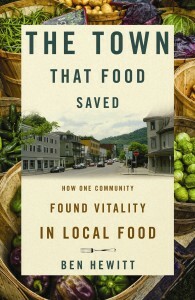 This should be an inspiration to chefs, farmers, fishers, local artisanal producers around the country to continue forming business relationships for all the reasons highlighted in Hewitt’s book and this excellent piece. Hewitt is definitely doing a lot of things right if he and his family are producing 80 percent of the food they eat. I’ve got a pretty good idea of what’s involved with that lifestyle and it’s a genuine accomplishment. But what about the “Yuppie food” his neighbors are producing? $15/lb artisanal cheese, Pete Johnson’s “unbridled ambition combined with an entrepreneurial green thumb” (I’m guessing his salad greens are mighty pricey). Where is this stuff getting sold? Not much of it in Hardwick. I’m happy these agri-innovators have found a place where land is more affordable than elsewhere, to hone their skills and gain confidence, but the direction they’re gong in is the same path that Community Supported Agriculture already has blazed…ordinary working folks and pensioners can afford the food. Hewitt is not just showing his devotion to food but as well he it thinking a lot to the local economy. Through supplying vegetables in the locality, he is bringing cheaper prices to the local consumers. In addition to this, he is promoting healthy lifestyle to their neighborhood. He is providing a sustainable food production in North Central Vermont and maybe has moved hundreds of people to have garden in their own homes and giving 125 jobs in the locality. I hope President Obama can read this, and probably he could make this a program to save people from unemployment. Taking steps like the Hewitt family would help a lot of Americans (and others in industrialized societies) hedge against the risk of economic and societal collapse. Plus, you can always sell the food you don’t eat yourself. Loved this article.